To understand what we mean today by "Homo erectus", some history of pale anthropological thought is needed. The first early human fossil found outside of Europe was the Trinil 2 fossil skullcap from the Solo River in Java. The fossil was placed in the species Pithecanthropus erectus by its discoverer Eugene Dubois. Almost 40 individuals have been recovered from Java to this day, roughly equivalent to the number of fossils found at the caves of Choukoutien in China. The Choukoutien fossils found were originally assigned the species name Sinanthropus pekinensis. It was not until the 1950's that Ernst Mayr proposed that all of the specimens from these two roughly contemporaneous locales, along with others localities from Europe and Africa, represented a single species, Homo erectus. Since the 1950's, however, the early African populations of what Mayr termed Homo erectus have once again been split into a separate species Homo ergaster. 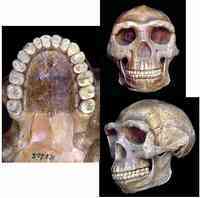 Homo erectus exhibits many features particular to the species, including a long skull shaped with thick cranial walls. The back of the skull is marked with a protuberance known as a transverse torus. Over the eyes is a large and prominent brow ridge, or supraorbital torus, which joins the rest of the frontal bone at a depression, called the sulcus. Cranial capacities of Homo erectus average around 1000cc, which is far greater than earlier australopiths and even early Homo. The dentition of Homo erectus is nearly identical to modern humans, although the cheek teeth do remain larger, and the mandible is generally more robust. The species Homo erectus is thought to have diverged from Homo ergaster populations roughly 1.6 million years ago, and then spread into Asia. It was believed that Homo erectus disappeared as other populations of archaic Homo evolved roughly 400,000 years ago. Evidently, this is not the case. Recent studies into the complicated stratigraphy of the Java Homo erectus sites have revealed some surprising information. Researchers have dated the deposits thought to contain the fossils of H. erectus near the Solo River in Java to only 50,000 years ago. This would mean that at least one population of Homo erectus in Java was a contemporary of modern humans (Homo sapiens).